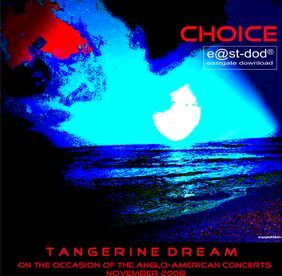 The Eastgate Music Shop about the CD release "This special limited EP has been produced on the occasion of the Anglo-American concerts in November 2008 where TD performed in London, Edinburgh and Los Angeles. Enjoy a freshly re-recorded version of Love On A Real Train (Risky Business) from the movie Risky Business as well as a newly re-recorded version from the track Scrap Yard from the movie Thief. This little EP closes with a warm Irish traditional track called Sally's Garden performed by Linda Spa and arranged by Edgar Froese. PS: Enjoy this CD with a 15 minutes track while having a cup of tea or coffee with your friends! That's why we call it (mini) CUPDISC! :-)"
Love On A Real Train 2008 has been entirely re-recorded by Thorsten Quaeschning. It is now more than twice as long as the original version and features percussion by Iris Camaa. Scrapyard 2008 is performed by Edgar Froese with Bernhard Beibl on guitar. Neither CD nor the cardboard sleeve show any order number or barcode, but the number given below is the order number the Eastgate Music Shop lists this release. 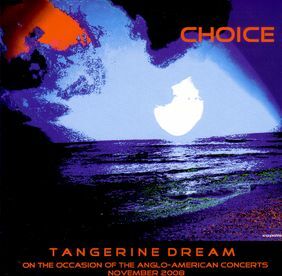 In December 2008 this release became available as MP3 download at the Tangerine Dream Download Shop as well.